This morning we got in our Dodge Durango and headed down the A-3 south. As we crossed on to the Kenai peninsula, we headed south and west. In the town of Cooper’s Landing, we stopped for lunch at Sal’s for some fish sandwiches. Then we headed down to the nearby Russian River to see the salmon derby on the river. This was the famous site of combat fishing during the peak of salmon season, but we still saw a lot of fishermen on the river fly fishing. Some Alaskans were even having a salmon bake with their families. 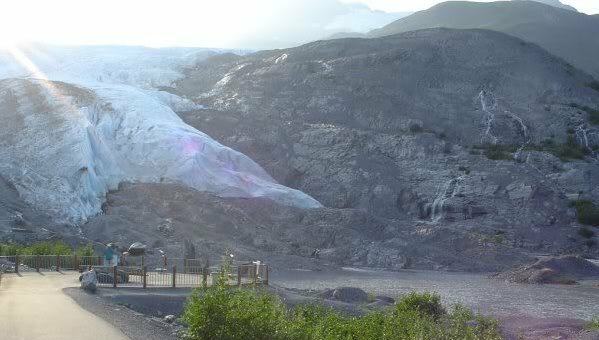 Later that afternoon, we drove through Soldotna to the town of Kenai, located on the western coast of the Kenai peninsula overlooing Cook Inlet. The 180-mile long inlet connects Anchorage with the Gulf of Alaska in south-central Alaska. We saw the most beautiful Russian Orthodox Church, the Holy Assumption Orthodox Church, also known as Church of the Assumption of the Virgin Mary. A church was first built on the site in 1849. Today’s church was the second one built from 1895 to 1906, with the Chapel of St. Nicholas finished in the latter year. The rectory was built in 1881 and is the oldest surving building on the Kenai Peninsula. Today the church is a member of the Orthodox Church in America and is the oldest standing Orthodox church in Alaska. The area around Kenai has a strong Russian heritage dating back to 1741 when fur traders first arrived. Fort St. Nicholas, a Russian trading post, was first constructed in 1791 as the second permanent Russian settlement in Alaska. Jeff found a café in his Lonely Planet guidebook called Nina’s Samovar Café famous for its Russian borsch – a beet soup. Jeff told me he though we were at the place when we pulled into a small village called Nikolaevsk. I walked though a front porch and knocked on a front door. The lady, who even had a Russian accent, asked us who we were. Apparently I was not at Nina’s Samovar Cafe. We all had a good laugh! She directed us to it, but unfortunately it was closed on Sunday. We headed back on Highway 1 on the drive down the coast of the Kenai Peninsula we saw a number of huge volcanoes across the Cook Inlet which created a beautiful backdrop to the Cook Inlet. That evening, we arrived in Homer, a famous artistic and fishing community located at the end of a spit in at the end of all roads in central Alaska. After checking into the Land’s End Resort at the end of the spit, we walked the small peninsula and ate dinner at Captain Patties. We had some great steaks tonight. We definitely went to bed with full stomachs!